Today marks the one hundredth anniversary of the Representation of the People Act receiving royal ascent. It was the state finally accepting that women were as capable of making decisions as men. Well, nearly, women still had to be nine years older in order to vote at the time. It has meant that a lot has been written, said and broadcast about the Suffragettes this week. Some of it great, much of it either a little lazy or deliberately misleading. There’s been a notable upturn in media reporting on the more militant tactics the women used in their campaigning than in the past, so it’s certainly an improvement. 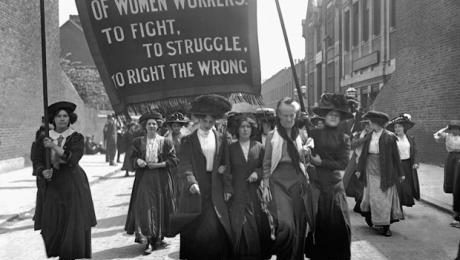 As our contribution we’re republishing an article from Organise 84, written on the eve of a general election and with the Suffragettes firmly in mind. Most of us are soon able to point out that starving children in specific regions within Africa or anywhere else are unlikely to know or care whether we finished our second scoop of over-salted instant mashed potato, though they might appreciate fairer global economic systems governing food production and distribution1. It took me a lot longer to untangle the second fallacy. It was a lot longer before it occurred to me to try. In fact, there are several fallacies underlying this one, and it’s worth going through them in detail. Fallacy no. 1: The Suffragettes would have cared about whether or not I vote. 7th, she would be far more appalled by the cuts to essential women’s services that every option on the ballot would continue to implement, than at women who spoiled their ballots or stayed away. I like to think she’ll give me an approving nod as I substitute my ballot paper for a sheet of folded bog roll, but honestly, if I believed in an afterlife I’d be sure that Sylvia Pankhurst, of all people, would be doing something better with it than haunting polling booths. She’s probably swanning round Europe with the spectre of communism. Here’s the thing: the suffragettes never intended it to stop with the vote. They weren’t satisfied, and they didn’t intend us to be. We respect their memory by continuing their work, not by being content with it. We also need to remember that “suffragettes” was a blanket term for a diverse women’s movement. ‘fallen women’ and were happy for the vote to be extended only to a married and propertied respectable few, but who’d want to honour their memory? For the Women’s Social and Political Union in the UK, at least at the beginning, there was a lot more to it than the vote itself. Being denied the vote was an infantilisation, an insult to women as intelligent, rational human beings, regardless of how much use the vote itself would or wouldn’t be. Using the vote was almost beside the point compared to what it would mean for women to have the vote, to not be designated as mere extensions of their husbands but decision-making adults in their own right. shed load more than a woman Prime Minister and all the other careerists who’ve cynically used women’s struggles to promote themselves while throwing working class women under the bus. It was about women’s solidarity, women’s ability to work together and stand up and fight together, to write and speak from their own experience to each other and to the world, not just on the vote but sexual, social and vocational freedoms, including fair pay and reproductive rights. The partial information we get fed at school paints the suffragettes as a peaceful campaigning lobby, who were awarded the vote because they made their case well and proved their economic worth while the men were being fed into the slaughter of the first world war. The truth is, the suffragettes achieved their aims because they were a radical, inspirational and effective direct action movement. They achieved incredible things for themselves and for future generations of women, and yes, they deserve our respect and our gratitude. But more than that, they deserve our study and our effort to comprehend the full enormity and complexity of their struggle. They deserve better than to be reduced to a single-issue soundbyte, their courage and militancy twisted into a liberal message of support for the system many of them never stopped fighting when their leaders were co-opted. They deserve so much better than to be used manipulatively, as bogey-women to shame us into a tokenistic legitimisation of the very systems they opposed. ← Support anarchist and antifa prisoners in St. Petersburg and Penza!